“We weren’t expecting this at all,” Dr Melvyn Lintern, a research geochemist at the CSIRO and the study’s lead author, said. 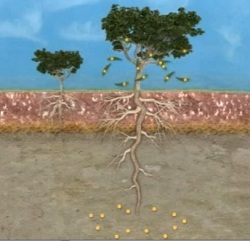 Dr Lintern said the trees appear to be telling scientists what is happening under the earth’s surface. “The particular trees that we did the research on appear to be bringing up gold from a remarkable 30 metres depth, which is about the equivalent of a 10-storey building,” he said. The research group used the CSIRO’s Maia detector for x-ray elemental imaging at the Australian Synchrotron in Melbourne to analyse extremely small particles at high resolution. The portions of gold are about one-fifth the diameter of a human hair. Dr Lintern said even 500 trees growing over a gold deposit would only yield enough gold for a wedding ring. The researchers said they have also found gold in the leaves of other trees, such as the Acacia mulga. “We’ve actually found gold not only in trees but in shrubs that are growing beneath the trees as well, so (it is) not restricted to any particular trees at all,” Dr Lintern said. The discovery, the first of its kind in the world and the first time gold particles have been found in living material, will undoubtedly generate huge interest from within the gold mining and exploration industry. Former Newmont Mining Geochemist, Nigel Radford, says the implications for gold exploration are huge. “A lot of this stuff has been speculated about for some time, but the identification of the gold particles in the leaf materials is completely convincing and very, very important for the future of mineral exploration,” said Mr Radford, who has worked in mineral exploration his entire working life, most recently with US-based Newmont, one of the world’s biggest gold mining companies. Mr Radford believes it has the potential to make gold exploration much quicker and cheaper. “Ideally, any mineral exploration team would like to collect their samples on-surface,” he said. This entry was posted in Environment and tagged ecalyptus money tree, gold tree. Bookmark the permalink.